I got it Paul. You can make more refined variations of a tilt. I got it too Paul. Perfectly clear. I'm working on a new MS project and needed a simple filter to gently skew the spectral balance of the Side channel to provide frequency-dependent Width. The Ambler Tilt control has been on my "to do" list and seemed like it would be ideal. For this application its "non-surgical" approach is. I needed a gentle +/-3dB range with a 1 kHz pivot rather than the typical tone control ranges of 6 dB or more. I calculated the values based on equations provided in the OP. The total span from the low to high frequency asymptote is 6 dB. 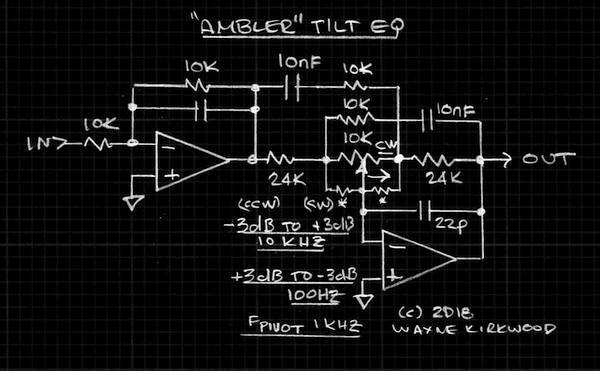 "Ambler" Tilt Equalizer with +/-3 dB range at 100 Hz and 10 kHz and 1 kHz Fpivot. The final application will typically have a stepped switch for the 10KΩ pot with guaranteed make-before-break action of the wiper to maintain bias current. When a pot is used high-value resistors (marked *) can be installed to bridge the wiper to maintain feedback and DC bias in the event the wiper lifts during rotation. These "bowing" resistors do affect accuracy so the larger they are relative to the pot, within reason, the lesser effect they will have on accuracy. A low bias current bipolar op amp or FET input is a good choice for this socket. From what I've read more recently, I'll go out on a limb and say that RCA called it compensation from the viewpoint that it came from the film industry, and they viewed the total system, microphone to theater speaker as one chain. At many points there were EQ elements to counteract others; compensate for ribbon microphone top frequency loss, etc. I don't know how involved RCA was but it is logical, the audio industry was a lot smaller back then. My dad worked at RCA much later (in the 1950s as a recording engineer). In the 1930s he worked at Western Electric and even worked at the joint venture between W.E. and Warner Bros called Vitaphone. Back then the sound for film was cut on large discs. In some of my dad's notebooks I see work on sound printed to film (optical) but don't know where they (W.E.) were in that development. I regret that my dad died before I was old enough to ask him good questions. I just noticed that the Ambler Tlit EQ, if redrawn, is a Wien bridge. One top arm is the 24K, the other top arm the 10K+10nF. Below the 10K+10nF top arm is the 24K bottom leg. Below the 24K top arm is the 10K+10 nF leg. The pot sits between the arms and legs of the bridge. The top point of the bridge "diamond" is driven by input, the bottom point by the op amp output. When the pot is centered, the bridge is held in balance and the effect of the two reactive branches cancel making the response flat. 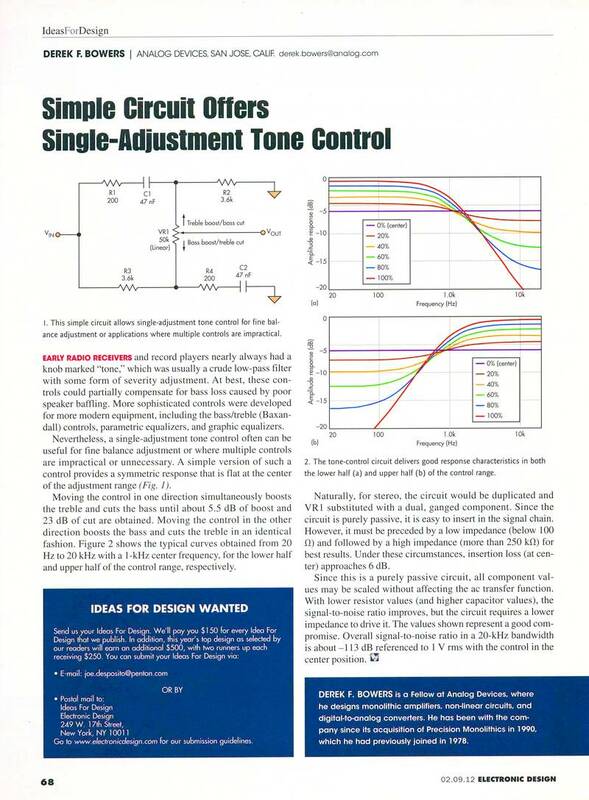 Simple Circuit Offers Single-Adjustment Tone Control," Derek Bowers, Electronic Design, February 9, 2012. Really sorry I'm running so late to this party, somehow I completely missed it. The Linear Tilt function that we use in our G23 is basically different from all the ones described in the thread here. It's idea is to use a cascade of shelves to realize a linear 1/8 order or 1db/oct function (kinda like when you do pink out of white noise @3dB/oct), and then use this function block wrapped around a tilt function. The "Ambler" refers to his design of the tone control of the Quad34 - http://www.4tubes.com/SCHEMATICS/BY-BRA ... Quad34.jpg - where he wraps two time constants around the tilt, we just took this concept and extended it ad absurdum. No rocket science, but no one seemed to have done it. The linearized tilt function comes with two significant benefits over the classic first-order approach: 1) the filter phase response/group delay is distributed very evenly across a lot of space (7-8 octaves), which leaves very little roll in any given range to annoy your ear. This means that you run less chance of a delicate mix falling apart when tucked slightly to the brighter/darker. 2) Linear transfer function means that we do NOT need to select between different "rotation points" like needed with the traditional first-order filters. This because a different rotation point would just equal a different gain in any point - not a different transfer function.